The Rushcutters Bench draws on my experience of living in a flat in Woolloomooloo, Sydney. The powder-coated steel frame was inspired by the bent-pipe ceiling trusses in the old Finger Wharf building. I would often marvel at these industrial fixtures rendered beautiful with white paint, and strove to emulate them in my design. 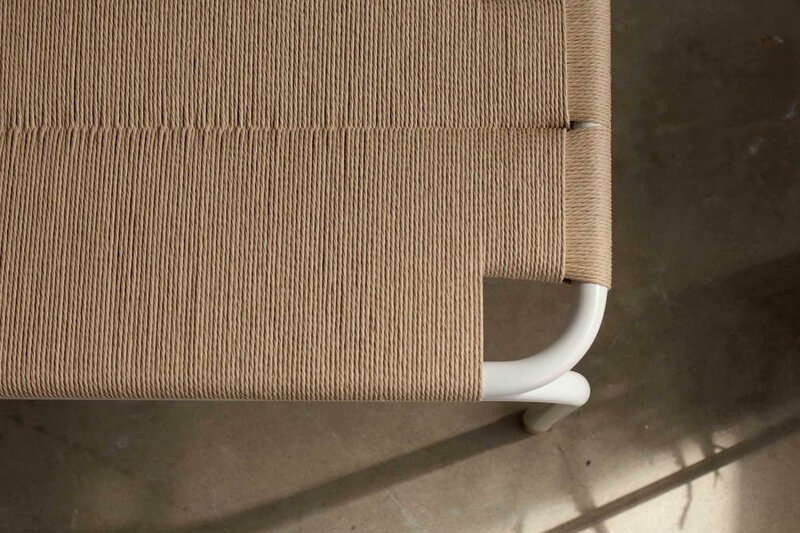 When weaving the Danish cord seat, I took pains to avoid the rigid structure common to Mid-Century Danish designs. Instead, I tried to design a weave which would evoke the rush thatching used by early settlers in Rushcutters Bay, around the corner from Woolloomooloo. The Rushcutters Bench is available in chrome and customisable powder coated colours. The Rushcutters Bench was named a finalist in the Australian Furniture Design Awards 2017.